More articles about Lean can be found using the blue dropdown menu above left. This is the opening, introductory article. 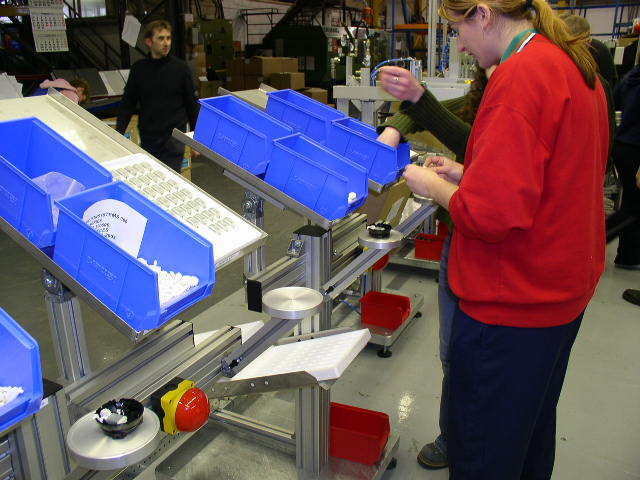 Lean manufacturing is a method to improve industrial and administrative processes. Just as the Theory of Constraints (TOC) and Quick Response Manufacturing (QRM), Lean manufacturing was developed using a logistics management line of approach. Often a chain of activities is needed to finish a product or task. If in such a case the work is done fluently enough, it can be done without waiting times or (intermediate) stock. Striving for an optimal flow is therefore the fundamental principle of Lean manufacturing. Lean concentrates on maximising the value which 'streams' towards the customers, and it traces and eliminates waste. For each family of products, a process flow diagram (value stream map) is used to identify which processes add value to the products or services provided by your company, and which don’t. The goal is to make a “value stream” as large as possible. This is done by gearing the steps which add value to one another, and by eliminating steps that don't add value. To see where a process deviates from the ideal picture, visual management is important. Workers and managers should be able to see at a single glance what goes well and what doesn't. In addition, it is important that everybody can contribute everyday to make the production chain increasingly better. The idea to concentrate on maximizing the throughput is already very old, it goes back to the building of ships in Venice in the sixteenth century. Later this approach was adopted by Henry Ford, who developed a moving assemby line. With that line he could transform raw materials into a T-Ford in only 33 hours (flow-concept). After this, Toyota became leading regarding the further development of Lean manufacturing. Their most important contribution is that they made it possible to make multiple products on a single assemby line, while at the same time the production rate is determined by market demand (pull-concept). After all, making products which are not ordered yet is also a form of waste! Lean was defined as a combination of flow and pull by researchers of the Massachusetts Institute of Technology (MIT) in the US, after they had studied the Toyota Production System, see the lean cycle of Womack & Jones. Originally, Lean manufacturing was mainly applied by companies that produce goods via a series of consecutive steps. This means there are plenty of points where wastage can be minimized, especially if the company is part of a supply chain! Examples of these early Lean adopters can be found in the automotive, metal and electronics sectors. Later, Lean evolved into a process management method that is generally applicable – even outside production. Especially Value Stream Mapping and lean management turned out to be useful in almost any organization, including hospitals. Lean can also be applied during product development, as Philips does when they speak about “Lean Product Innovation”. The introduction of Lean on this webpage is mainly about the technical side of this approach. Note however, that the organisational part is just as important! By Dr Jaap van Ede, editor-in-chief business-improvement.eu. The first version was published in the Dutch specialist journal PT Industrial Management. Lean manufacturing is all about making the “value stream” as big as it can be, so that the company concerned is spending all its time on creating added value for its customers. Other activities are regarded as waste. The more processing steps there are in a production process or supply chain, the more sources of waste can be minimized! Ton Aerdts is director of a consultancy. He advises and supports companies during process improvement trajectories. He often applies techniques such as Lean Manufacturing, Six Sigma and Total Productive Maintenance. According to Aerdts, about 15 years ago lean manufacturing used to have quite a negative connotation in the EU. Identify – per product or product family – what the customer values. Use value stream mapping (VSM) to indicate which processes add value and which don’t. Eliminate eight types of loss: overproduction, inventory, manufacturing faults, manufacturing disruptions, waiting times, transport, unnecessary movements - which includes searching for things in the workplace - and last but not least: unexploited talent. Create flow: Ensure that materials flow smoothly through your company. Stoppages lead to stockpiling and therefore to waste. Create pull: Make your production chain demand-driven. Producing an item no one has ordered is also a form of waste. In lean manufacturing only those processes for which a client is willing to pay are regarded as profitable. Any other activities are essentially waste, and should be restricted as much as possible. Once a companies starts to apply lean manufacturing, they tend to put that label on all other process improvement methods they already use. This broad use of the term “Lean” can lead to confusion. There are people who grasp each problem within Toyota, to state that Lean now really is out of date. Others fight tooth and nail to defend the production system of the Japanese car manufacturer. Both attitudes are rather peculiar. What we call Lean today, is no more or less then the state-of-the-art to deliver good quality products or services on time, and at the lowest possible cost. So, even if Toyota fails, this does not mean that Lean comes to an end. Regardless of how well Toyota is doing, our view on smart production will continue to evolve, like it did during the last century. Besides that it catches the eye that Lean turns out to be applicable in an increasing number of organization types. Even design to order production and administrative processes can be made Lean. This is also a matter of evolution, since Lean is adapted to match with these new environments. More about this in the article the evolution and state-of-the-art regarding Lean. Lean aims to maximise the value which 'streams' towards the customers. To clarify this, the introductory article on this webpage is mainly about technical aspects and tools like Value Stream Mapping and Kanban. However, you should realize that these things only give direction to your improvement activities. Lean manufacturing is perfectly fit for flow-driven and discrete manufacturing, as we find in the automotive, metal and electronics sectors. Companies in those sectors have production lines with many processing steps and thus many potential sources of waste to detect and remove. In addition, they are often part of a supply network. The more complex the supply and production path to the final product, the more complicated it is to apply Lean, but also the more there is to gain. Multiple (consecutive) processing steps are not only common in discrete manufacturing, but are also found in environments like hospitals and even in offices. Also then there is a lot to gain by synchronizing the production steps, and by removing wasteful activities. Especially value stream mapping turns out to be a very a broad applicable improvement tool. The goal of Lean manufacturing is to make value streams, per category of products, as big as possible. Seven categories of waste should therefore be reduced as far as possible: overproduction, inventory, manufacturing faults, manufacturing disruptions, waiting times, transport and unnecessary movement. The last category includes looking for materials or tools in the workplace. The above mentioned sources of waste can be identified by Value Stream Mapping. After that, there are many tools which can be used to reduce wasteful activities. Many of those tools are based on (sometimes much older) production concepts, which were developed in the 20th century. The things which are - besides value stream mapping - most typical for Lean are described below, together with their relationship to Lean. Note however that there are many other useful tools, like the measurement of the Overall Equipment Effectiveness, see Total Productive Maintenance. Just-in-time (JIT): Production and/or delivery only starts after a (replenishment) order is placed. This prevents overproduction and therefore stockpiling. Kanban: This is a Japanese word meaning “sign”. Kanban applies JIT in a production chain to reduce intermediate stock. Components are made only when a sign indicates that they are needed by the next workstation. In the past these signals were in the form of cards, nowadays Kanban systems are sometimes electronic. Flow manufacturing: Per family of products, the machinery is positioned in the same order as the processing steps, to achieve a constant flow of materials and products through the factory. 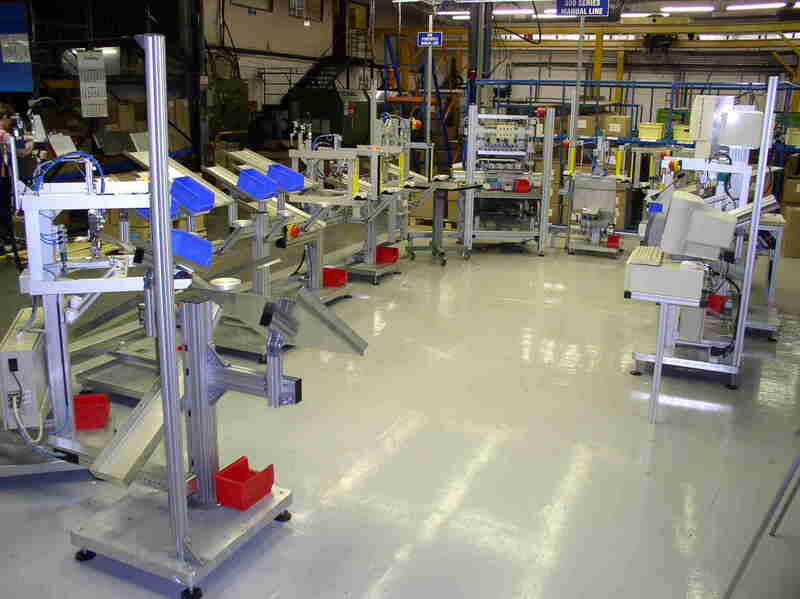 In addition, the batch size per production step is made as small as possible. This decreases the inventory and throughput time. One Piece Flow: This means moving only one workpiece at a time between operations. Sometimes this is seen as the holy grail within Lean manufacturing since it makes production possible with (almost) no intermedairy stock. Takt time: This is the heartbeat of a lean production system. Takt time is the time required per production step to satisfy the demand. If your customers order 240 pieces a day and your workday is 8 hours, then the takt time is 480 minutes/240 pieces = 2 minutes per processing step. Heijunka or leveling: This means smoothing the type and quantity of production over a fixed period of time, to reduce disturbance of the flow. Andon: A system - for example triggered by pulling a cord - to notify management, maintenance, and other workers of a quality or process problem. Problems are seen as possibilities for improvement! Cellular manufacturing: All required items (people, materials, machines) to make a certain product or product category are clustered in “production cells”. This approach can be seen as an alternative to flow manufacturing with dedicated production lines for families of products. Cellular manufacturing often is a good solution within companies that make customer-specific products. SMED: This stands for Single Minute Exchange of Dies, a concept developed by Shiego Shingo of Toyota. He suggested that molds used to form car bodies should be exchangeable within ten minutes. Later the term “SMED” was expanded to encompass the reduction of machine change-over times in general, with the aim to reduce waiting times, so that demand-driven production with small batch sizes becomes possible. Visual management: This refers to an orderly organization of the work floor, so that everyone can survey the status of the entire production process in a glance. This way workers and managers can quickly intervene if problems arise, which reduces the number of mistakes. 5 Why's or Why-Why-Why: Method for root cause analysis, by repeatedly asking why a problem occured to reach a deeper level. Lean management: In a Lean environment, everything is focused on stimulating and helping people, to achieve increasingly better business results together! To build a culture like that requires a profound transformation. Go to the Gemba (Go and See): As a part of Lean management, managers should visit the workplace much more frequent then before, to help find and solve problems. So, Lean is not simply reducing waste, but the management part is half of the job. This subject is dealt with on the site section lead & change. A3 management: To structure a dialogue between a problem solver and his or her mentor, a piece of paper with the size of an A3 is used. On this paper, the problem analysis is put down by the mentee. Next, the A3 is rewritten several times after hints from the mentor. An A3 can for example be revised after a visit to the Gemba which yields new information, or after receiving feedback from the workers about a possible improvement solution presented on the A3. This way, the A3 becomes a report of a journey, from the problem description to the suggested counter measures. True North: Lean is not about improving anything, but should be focused on things that increase the creation of value. Poka-yoke: Japanese for “simple, error-proof”. The aim is to minimize the chance of errors in processes. 5S: This refers to the five Japanese words seiri, seiton, seison, seiketsu and shitsuke. These stand for guidelines to organize a workplace in such a way that visually driven, lean production becomes possible. The emphasis is on a clean, tidy and organized workplace.